The featured image above was taken just after moving back into the new house on the farm. The old 1974 doublewide (nicknamed “The Mouse Hotel”) was taken down and replaced with a new manufactured home. 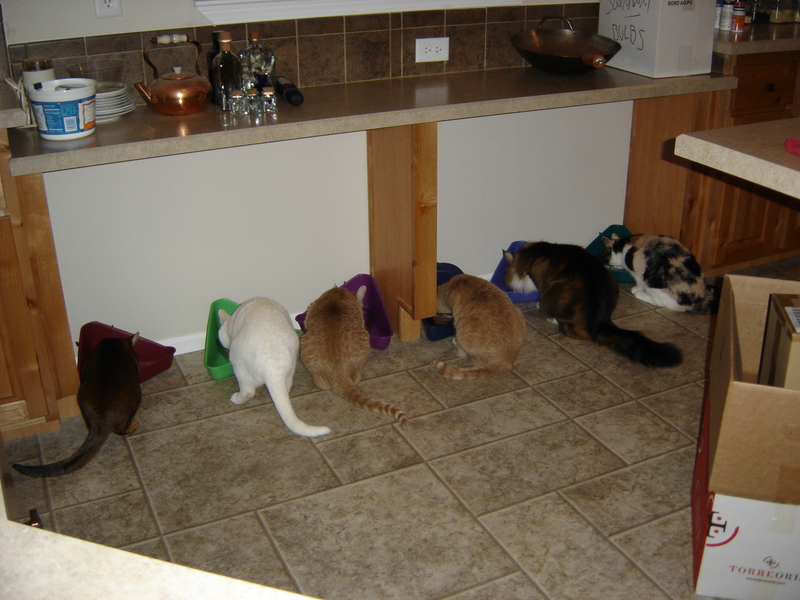 Everyone was hungry, and I was able to get this photo of all the cats in their dishes at the same time, tails pointed out. We use glass bowls set inside three-cornered pans to help contain spilled food. 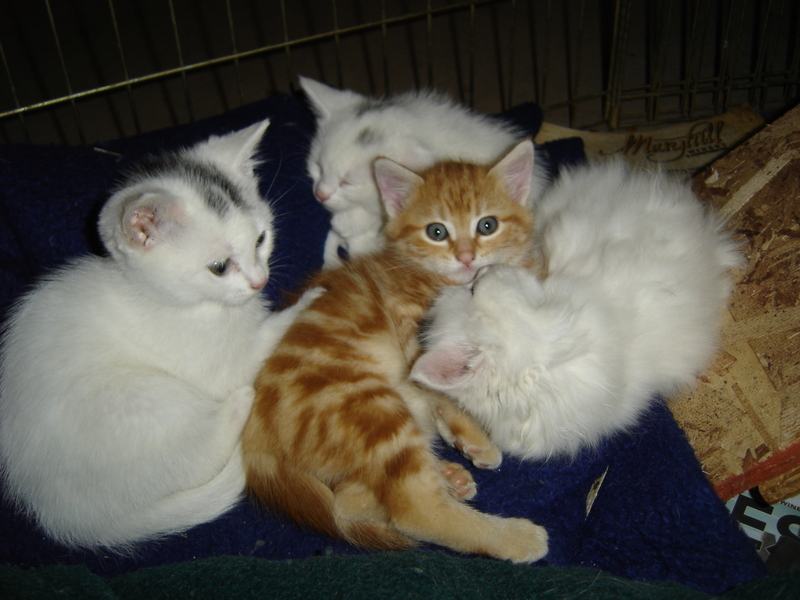 Left to right – Abby, Nano, Marcus, Hope, Lucio and Willow. All are rescues or refugees. Willow passed away on December 20, 2018. She was 22 years old. Our Abby cat. 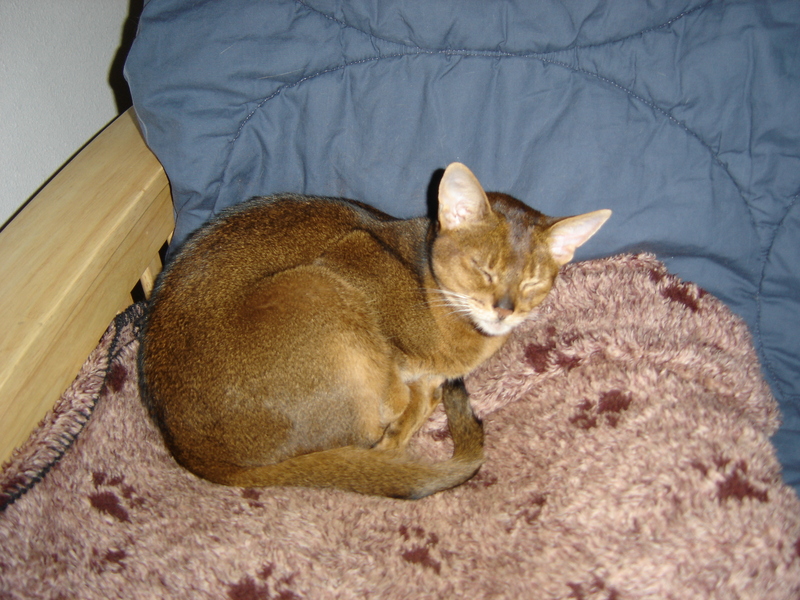 This little Abyssinian is blind in her right eye, but that doesn’t stop her from enjoying life. She has the biggest appetite of the lot, and is always in search of snacks, even if it is our plates. We have to watch her every minute…. She will be 17 in April, 2019. Previous owner rescued her from a cat show. She was headed for euthanasia due to her eye condition. Our Lucio cat , who loves a good snooze. Pictured here with Marcus in the lower set of photos, when Marcus was little. 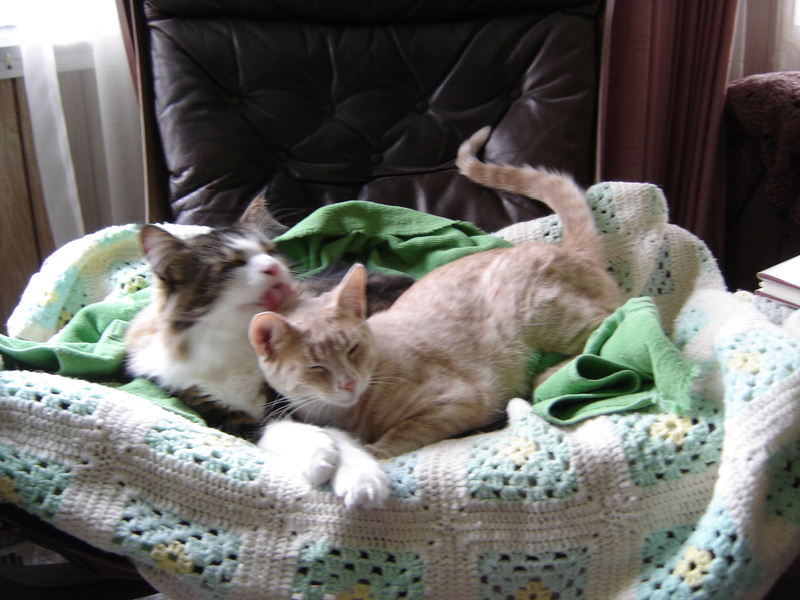 He loves to groom other cats, if they will hold still for it! Lucio was named for Lucio Sorre, a past president of The Society of Wine Educators. Lucio showed up one day at the farm, and has been here since. Both Lucio and Abby believe they are the Alpha Cat. Marcus and Hope, brother and sister. 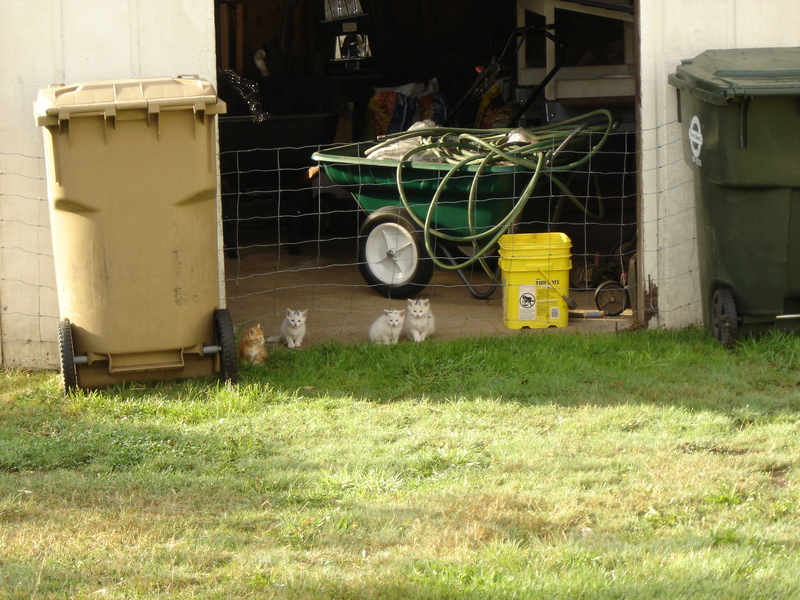 They were from the last set of mother-kitten refugees to show up here on the farm. 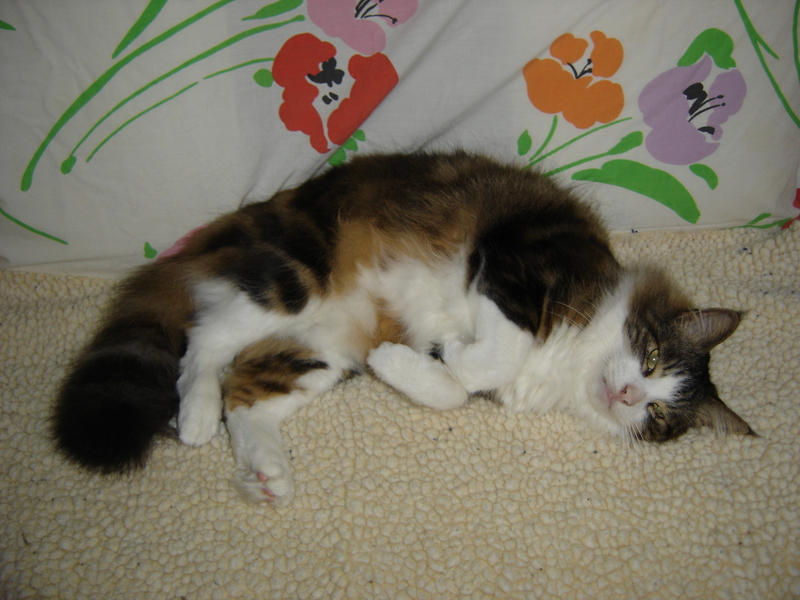 Marcus was the most congenial, Hope the most skittish, with not much of a chance of finding a good home anywhere. They can be hard to tell apart unless I see their tails. 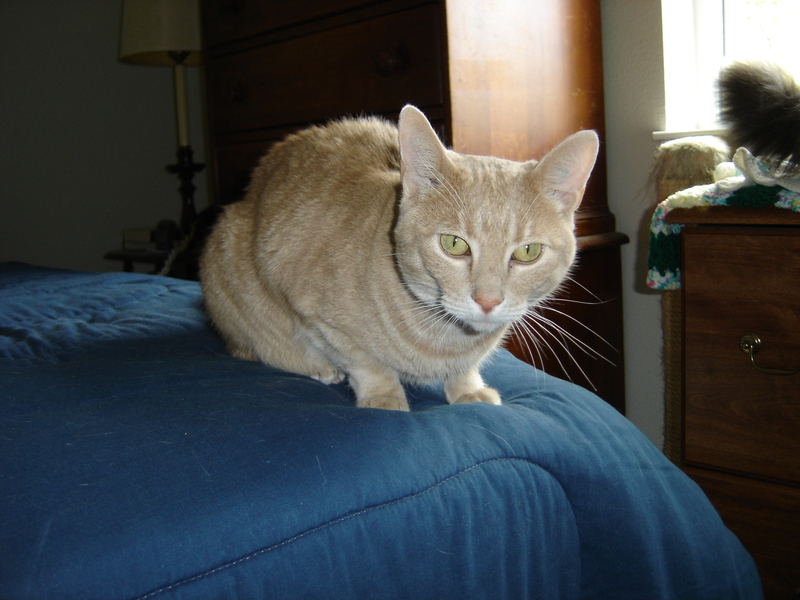 Hope has a shorter tail with a kink at the end, something she has had from birth. Still a bit wary, she has come a long way over the years. She also makes a “barking meow” call, like a small dog. 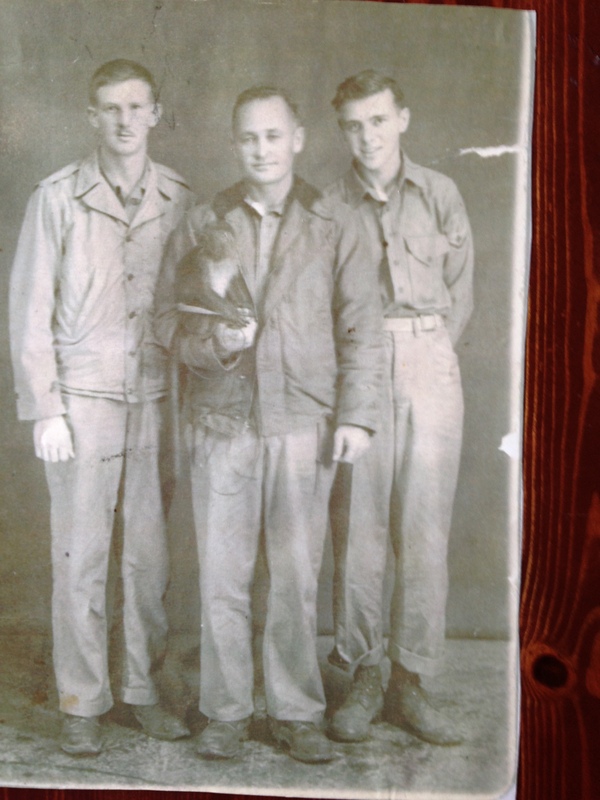 Marcus cat was named after my father, pictured below with two of his Marine buddies during WWII. Dad is the handsome Marine in the middle with the monkey companion. Dad was quite also quite fond of cats. Marcus cat was named after my father Marcus, the handsome Marine in the middle with his pet monkey. The photo is from WWII. The identities of his companions are unknown. Curious Nod, spying on outside activities. “You won’t believe what I just saw!” she says. Blynken the quiet Intellectual and sometimes, gossip, giving Nod an earful! Lovely long-haired Wynken, a very thoughtful girl. Lead cat of the Three Sisters. Below are some photos from their early days when they first appeared. When they first showed up, we put fencing in front of the shed to protect them at night. The little orange guy is Tio Pepe, the only male in the litter. Tio Pepe and mama Silvie found a home with a friend. (see the February 2014 Newsletter). 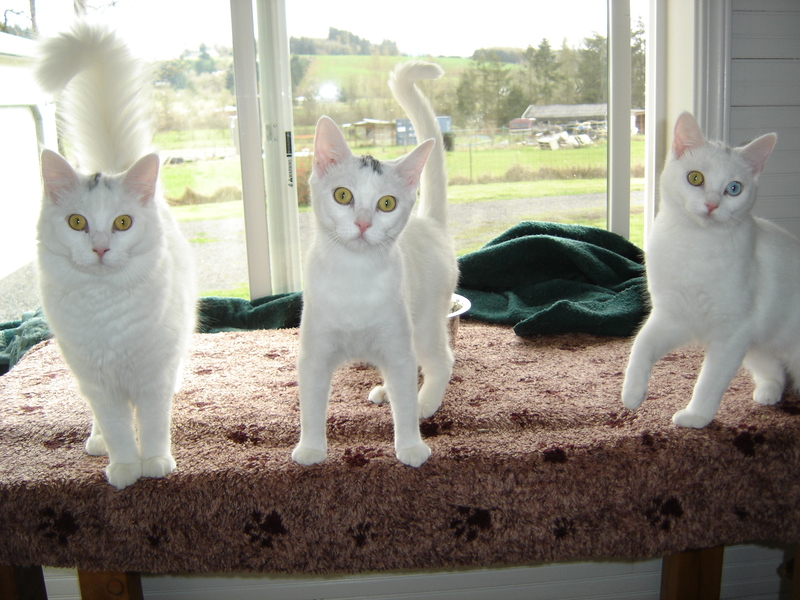 The Three Sisters have been with us for over 3 years now, and will remain with us. They will stay together as a family unit. 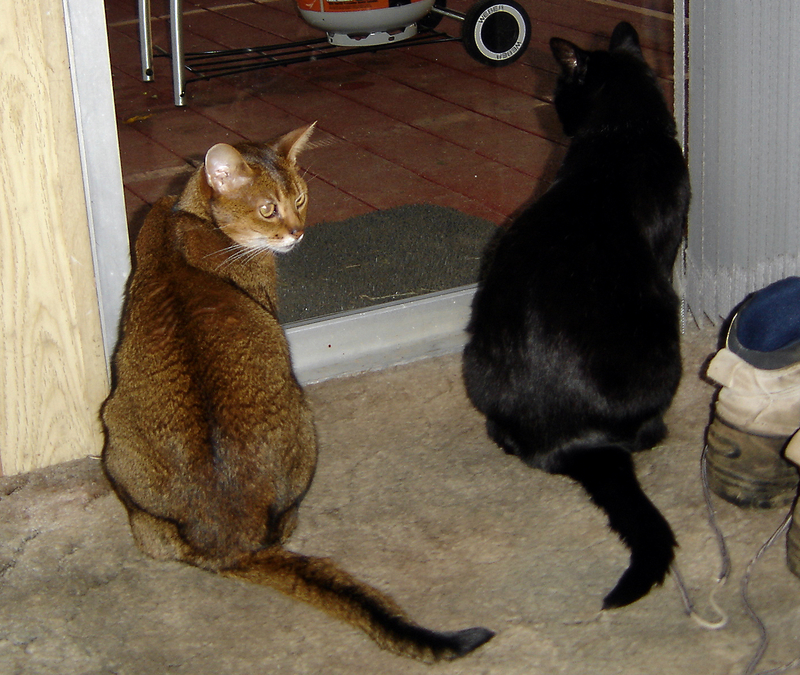 Cats Emeritus: These treasured family members have gone on to join the greater Universe. We miss them! Willow was roughly 22 years old when she passed on. 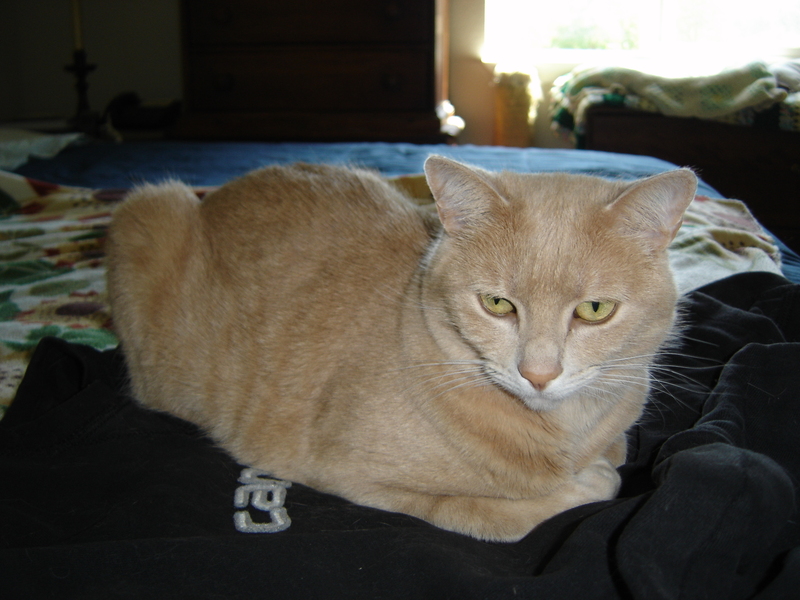 She was an exceptional cat, known for her spirit and opinions on life. 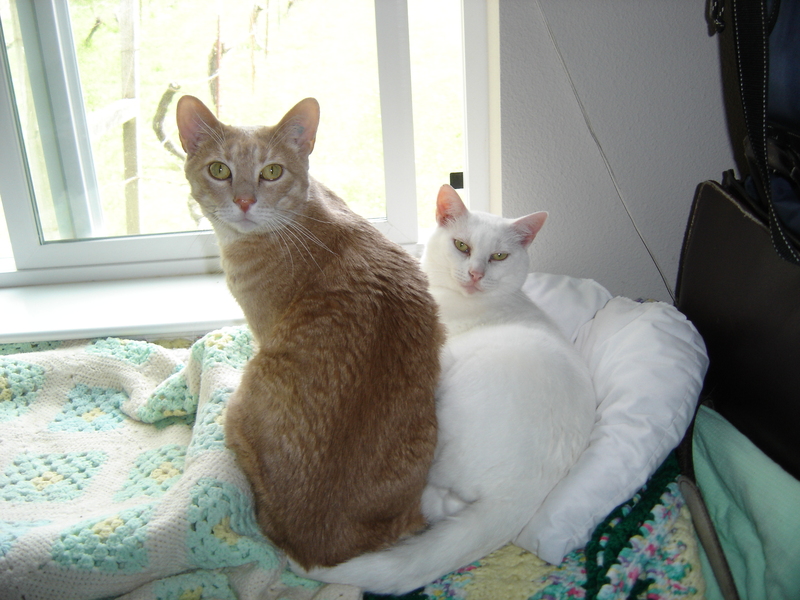 Mr. Austin, left, and Mr. Beaucastel on the right. Watching the grill on the old porch, waiting for the fish to come off. What a cute clutch of cats. They look like they keep you busy. Our old calico is the alpha cat around our place as far as she’s concerned. Thanks, Timothy! 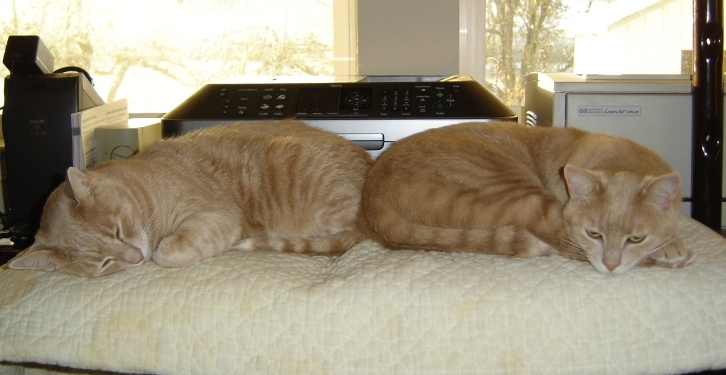 They are a wonderful bunch of cats, and they sure do keep us busy. I love the photos of your kitties too, especially Rosencrantz with those fangs! 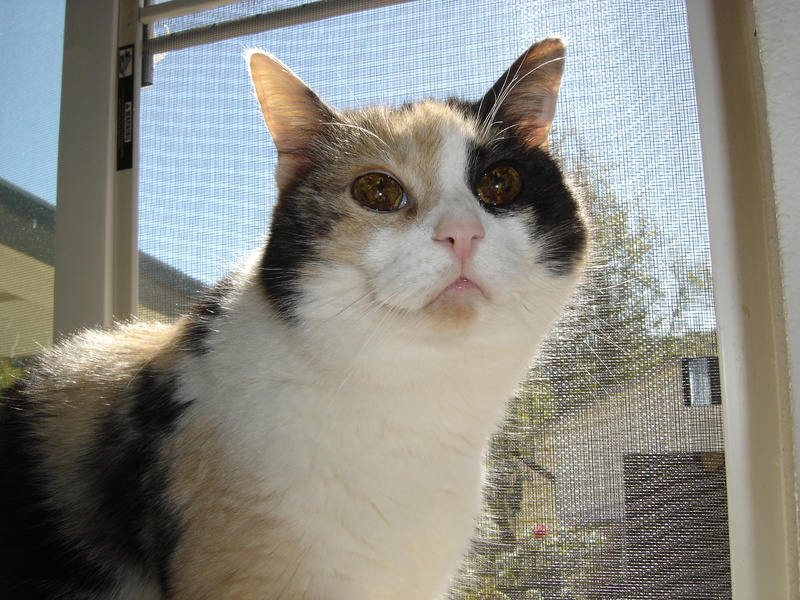 I think it is in the Calico genome to consider themselves Alpha cats. How lovely to meet your cat family, present and past. Adorable, all of them. Thank you! All different little personalities, and all so adorable. Cats are great companions. Thank you! We love it here, and every season has its own particular beauty. Australia, your home, is also quite lovely. I’ve never been there, but the photos of the countryside I’ve seen on various blogs paint a beautiful picture. Thanks for stopping by, Cynthia! They are all wonderful companions. Wonderful to see all your fur friends and hear their stories. You’re very kind and generous to have so many. My brother has four, I suffice with two. They came as a pair for a birthday gift from my brother. I’ve had many cats over the years but this is the first time I’ve had more than one. Even though they go at it sometimes, they still love to snuggle together which is so cute. Thanks for visiting my blog, much appreciated. Happy New Year! Music: a non-addictive, mood-altering non-substance. Common side effects include: dancing, leg rhythms, head-bobbing, finger-snapping, and song melodies stuck in your head. Ask your doctor if music is right for you. Tom – here are Jean and Greg’s WordPress sites. These musicians are out of Silver City, New Mexico. Hi Jean! Thanks so much for stopping by! WordPress does keep us all on our toes. The Three Sisters cats are just like the mountains! Snow white and streaks of grey on their rocky tops. Hopefully someday I will see you and Greg perform in person. A good festival to check out is the Spokane Fall Folk Festival. It is an indoor folk fest in November at the community college, multiple stages and lots of attendees. I hope to get back there eventually. I’m a caregiver right now, and my travel is limited. Thanks and appreciation goes out to you and your brother for getting your father’s photo into this page!! Thanks for stopping by! This is my favorite picture of him. I often wonder what became of his monkey friend. Perhaps another soldier took him on? 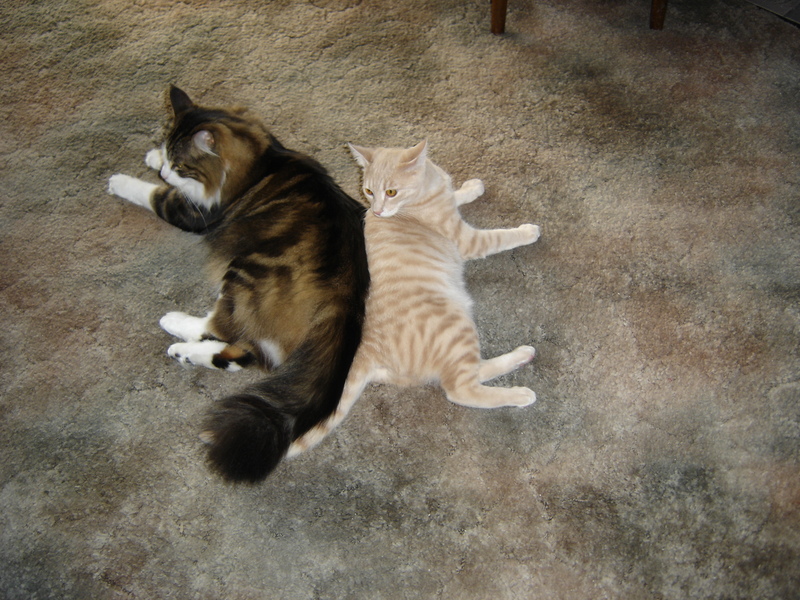 Dad was also very fond of cats, and I think would be proud to have one named after him. I have childhood memories of him, under a car changing the oil. Usually one of the cats was under the car talking to him. They would have a conversation going along the lines of “Really? You don’t say! Well then, I’ll have to do something about that!” I think he preferred their company over most people. He sounds like someone I could relate to! 🙂 The older I get, the more I understand him. 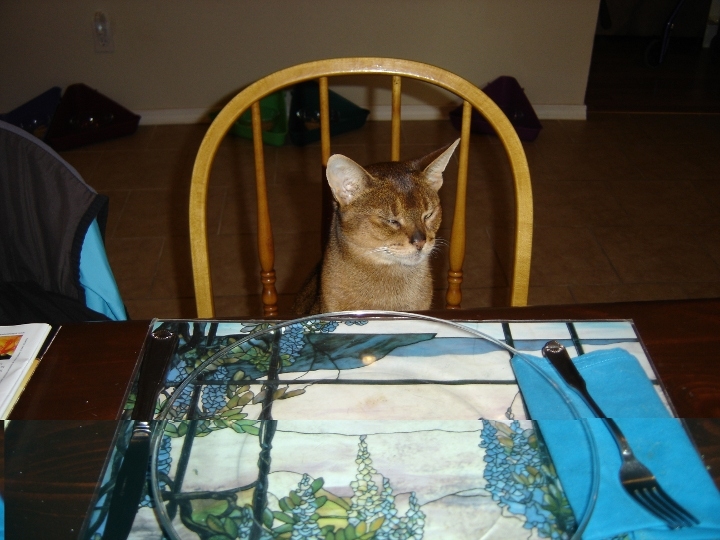 Readers, please visit Mr. Bowie’s site to learn more about this beautiful and talented British Shorthair! Mad Hooligans, thanks for stopping by! Welcome to Salmon Brook Farms! Thanks for visiting my blog, Lavinia. I must tell you that the banner photo of this page makes me smile. It is such a great photo! Best to you and Rick and the entire menagerie. Thanks for stopping by the cat page, Cynthia! That photo was taken right after the move into the new house, and all the cats were hungry and happy to have the food bowls out and loaded up with chow. We just got back from visiting friends and family back east we hadn’t seen in a long, long time, and it will take me a little while to catch up with all of you. All the best to you and your family! Thank you, Kevin! They are all beautiful little souls, every one of them. Readers, please visit Teagan’s Books at the link above. Always a good story in progress! Cats are very nice! I think it’s a lot of work with so many, but they give so much love again, and cure and understand you. I cannot have here any pets because paintings and paints are everywhere, but your place must be very safe. Happy, rich, healthy and creative 2017 for you and for all the extended family! The cats do provide so much love! They give us far more than we humans realize. We work at keeping the place safe for them. They continually find new ways to challenge us in that department. I used to do pen & ink drawings long, long ago, and also worked in acrylic paints. I could not do paints in here now, although I keep thinking about doing artwork again. The same wishes for you for 2017! Have a wonderful year ahead! What beautiful cats! I also have six cats! Oops, I have some catching up to do! Having previously met some of the cats in their roles as feline correspondents, It was nice to get their bios in this piece. Lovely family. What a full loving life you have with your furry friends! They reflect what I see in the wild and that is every animal has its own unique personality! 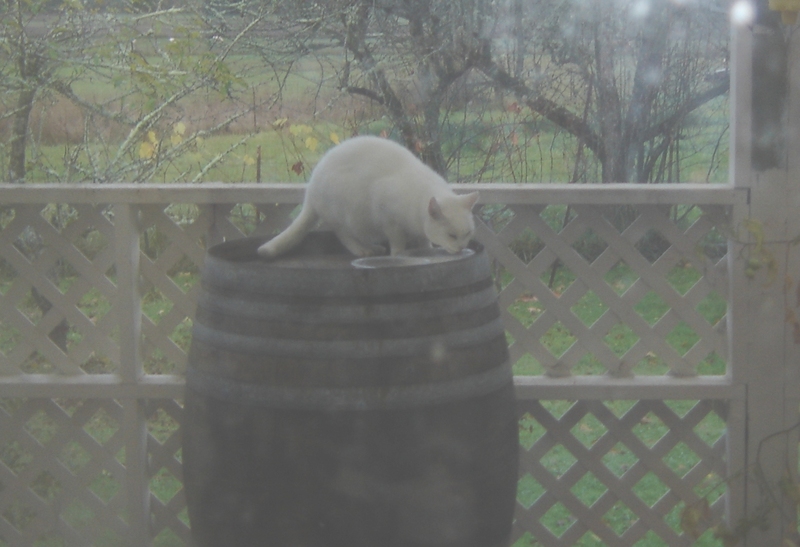 Nano has a wild streak in him.To grab Gophers would require great skill and strength! I bet nobody messes with him! 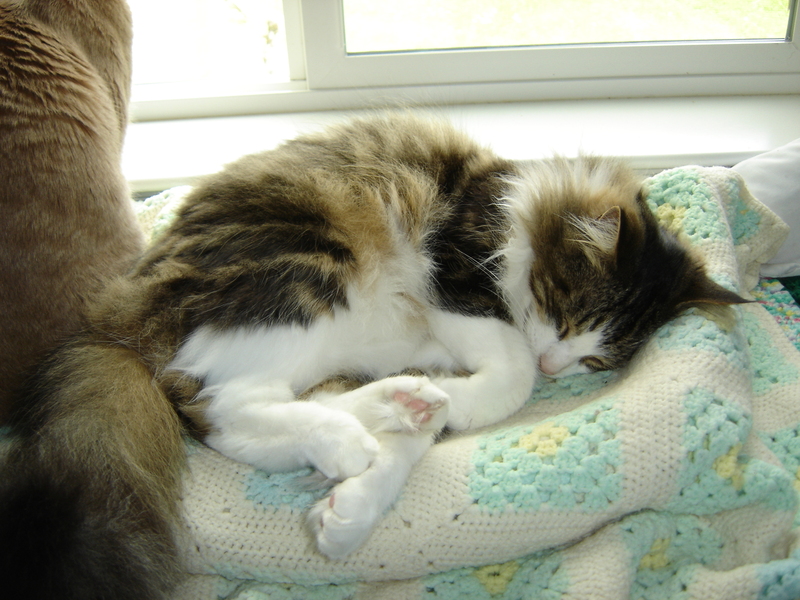 Abby was rescued from a cat show and she had a bad eye. She must of gotten the bad eye after being a show cat. CBC just had a great show on cats in shows. “Catwalk”. Good to see you, and thanks for stopping by, Toffino Photography! Yes, every animal, just like the human animal, has their own unique personality. All our cats have backstories. Mr. Nano was an outside cat, a feral, long ago. I brought him in about 9 years ago, when he was tame enough. I don’t let any of the cats outside to due to predators, traffic, parasites and various human activities in the area. When he was an outside feral, I watched him hunt, as well as other neighborhood cats. He would watch a gopher hole for hours. When one appeared, he did a vertical lift-off, coming down and landing right on top of the gopher. A miss can mean serious injury, and I have seen gophers turn and lunge at a cat. The Camas pocket gopher is one of the most vicious animals for its size known. All the best to you. You have some amazing wildlife photography posted! He’s my favourite! I’ve never heard of a cat taking down Gophers before. Here is a link to Oregon Department of Fish & Wildlife’s pocket gopher page. out of the five they list we only have the Northern. I don’t think we have any on Vancouver island. I love their crochet blanket! I crochet too for home and animal organisations. I have 3 at home, all come with stories and loveable personalities. I have more than 3 in the office car park. Thank you for stopping by, Kavita, and for the kind comments! Welcome aboard to Salmon Brook Farms. 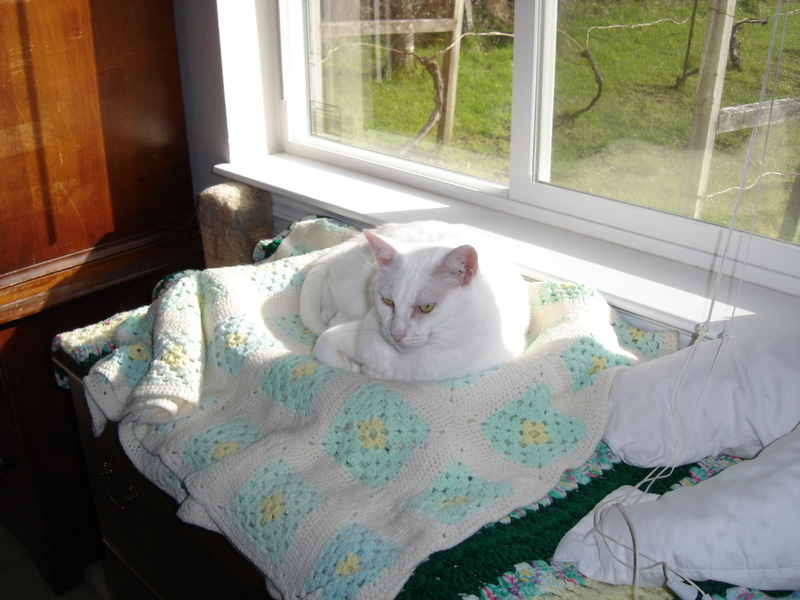 The crocheted blanket was a gift from a friend many years ago. I never took up crocheting, but it is on my list of things to learn. Thank you Lavinia. I love my kitties. I just bought a mountain of cat food, so treats ahead. Thank you for the warm welcome. Your home is beautiful.